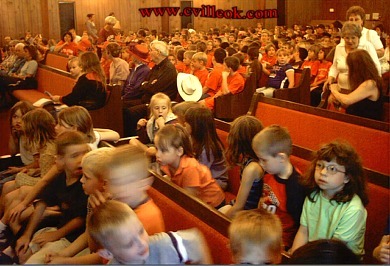 Actor Gene McFall (before he assumed his Will Rogers persona) at the Collinsville Baptist Church Tuesday May 4th. 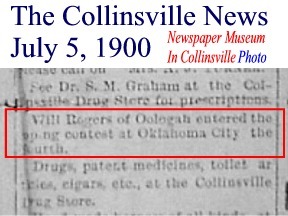 as published in Collinsville in 1935. 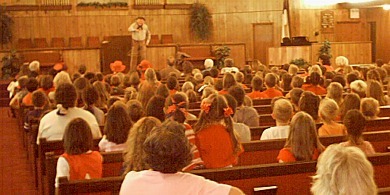 Hundreds of 1st and 2nd graders dominated the crowd for Gene McFall's "Witty World of Will Rogers" program. Gene McFall spent 6 years in Hollywood trying to find his niche. He was actor James Whitmore's understudy in a one-man show about Will Rogers in the 1980s. Gene wrote his own show in 1989 called the "Witty World of Will Rogers" and has been presenting that show to kids and adults ever since. 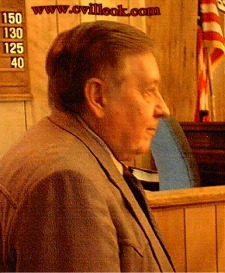 Gene has presented his show many times for the Library system here in Collinsville. Gene was born in Kentucky and started his acting "career" with the lead role in "Tom Sawyer" as a youth in school.